Greetings, Loyola! 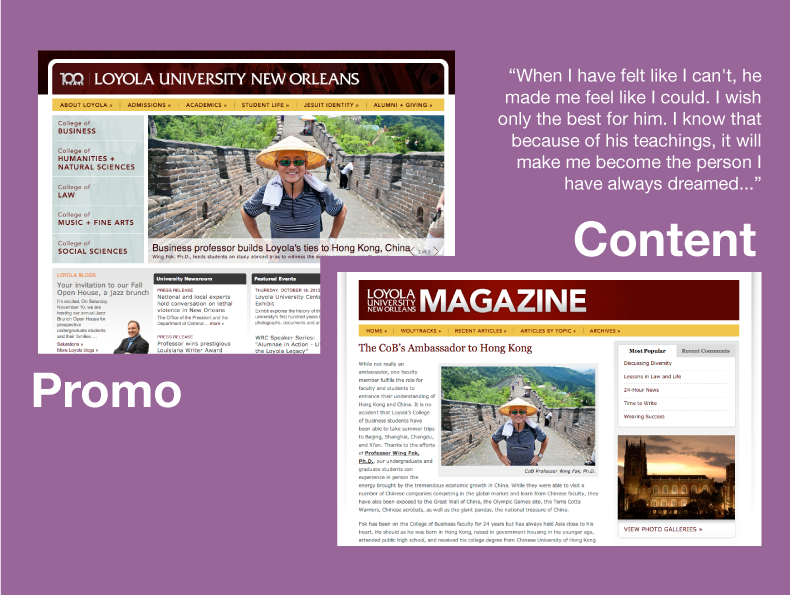 Recently I gave a seminar on the design of the Loyola website–how we got here, and how our campus web editors can (and do!) impact the overall look of Loyola’s online presence everyday. I’m going to break it down for you here. You wouldn’t buy a car without knowing that you could derive some value from its use. The same holds true for your college degree. And with 53% of recent college grads jobless or underemployed, families are more closely scrutinizing the value of a college degree. That’s why it’s more important than ever for us to specifically identify the tangible skills that students will gain from earning a degree in your department. Writing, public speaking and presentation skills, academic research and analysis of data – these are all marketable skills that employers are looking for and prospective students want to learn. They’re topics we should be talking about on the Loyola website. To make your words more meaningful, be concise and use pictures to illustrate your points. We could spend paragraphs talking about the essays that students will write when attending school, but ultimately, the reader will boil down those paragraphs to one point – our students are well versed in the written word. So we don’t need to hammer them over the head to make that point. Show, don’t tell your readers. Our students are very successful. I’m sure every university says something to this effect on their website. The better way to illustrate this point is to give examples. Remember to use the student, faculty, and alumni successes to tell the story. Including photos of the person whose success we are celebrating will drive home the point more clearly to our prospective students and their families. Earning a college degree will teach you a lot about negotiating life with limited resources, meeting deadlines, and how you as a person fit into the larger world. Earning a degree from a Jesuit university will teach you about your obligation to the world to share your skills and talents with others. We are not a community or technical college, but contrary to popular media on the topic, students from a liberal arts university such as Loyola leave school with tangible skills that prepare them for careers in a great many fields. Since our students are investing in their future, they want to know about these skills – organizational management, scientific research, forensic investigation. The more specific your explanations, the more helpful the information will be to your website’s readers. General overviews of department events or faculty interactions with students are less helpful than the specific takeaways. If you ever a question about the wording or the quantity of content, web communications is here to help. Please contact either myself or my colleague, Chantrice Banks. We will offer you the latest data on what works and what doesn’t and our best advice on your specific question. This post is a follow-up to a seminar I recently presented to our Loyola web editors. The goal of that presentation and this post is to look at practical, basic ways to look at how you are engaging your visitors and the success of your marketing strategies using Google Analytics as a tool. Don’t hide behind your numbers. Talk to the people that use your website and receive your emails. Ask someone if they had trouble finding something on your website. Do they feel like they get too many emails from you? Did they like that success story you posted about them, or did they not even realize it existed? The content you put on your website, in your email, or on facebook should strengthen the relationship you have with your audience. Web metrics is like taking a pulse, but looking in someone’s eyes and hearing their feedback is paramount. If you would like monthly overview reports for your website, submit a web request and select “Strategy” as the job type. Make sure to include the URL to your Loyola site in your request (ex. 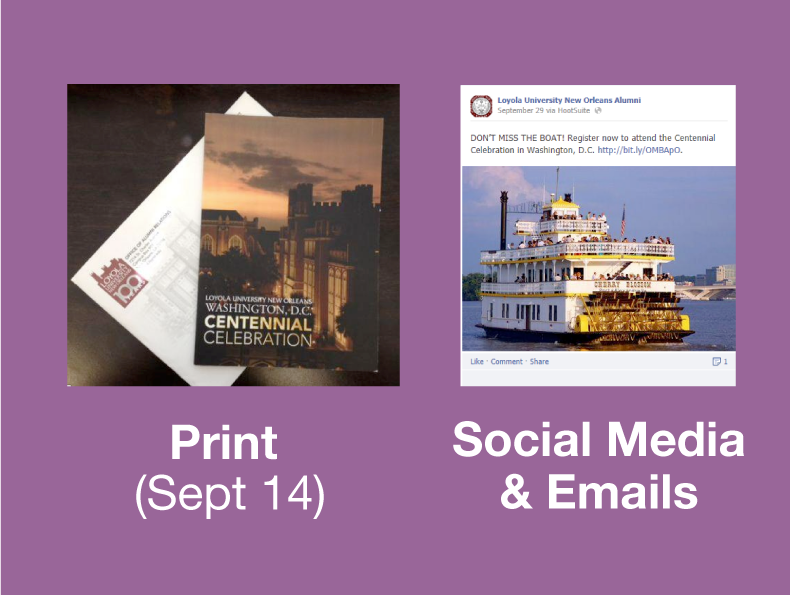 chn.loyno.edu/history) and the email you’d like it to go to. Below are some terms that I often get questions about. Unique Visitor – Person who may have come to your website multiple times, but is counted once. If a person uses more than one machine, more than one browser, or clears their cookies, they will be counted as multiple unique visitors. Visits – An interaction with your website that lasts 30 minutes or less. This could involve multiple events and pageviews in a single session. Unique Pageviews – Individual pages viewed by a unique visitor during a single session. If it’s viewed twice in the same user session, it’ll count as 1. Campaigns – Special variables that you can use in your links to track performance. Bounce Rate – The percentage of single-page visits (i.e. visits in which the person left your site from the entrance page). Last Saturday Alumni Relations filled the Cherry Blossom in D.C. with Loyola Alumni. The purpose was to celebrate our centennial and gather Loyola friends together. Analytics: Looking at unique pageviews told us how many people came to our registration page and also how many people looked at the attendee list. Looking at demographic numbers told us which cities were getting our message and responding by visiting the site. Takeaway: We met our goal and filled the boat, having a great time in the process. Now we can use the ratio of visitors to our registration page vs. registrants to get a feel for how future event promotions are doing as they are happening. Recently the Loyola Magazine website promoted this article about Professor Fak and it included both the professional side of a distinguished professor’s ties to Asia and lighter side about ping pong. A comment on the post shows that it connected with someone, and the Analytics shows us it engaged our readers. Analytics: It was the 2nd most popular content in past 30 days with most visitors coming from our homepage promo. The average time via different sources tells us not only were most visitors reading the article, but could also identify the level of engagement from each source. Those using organic search were most engaged, followed by visitors from our homepage promotion, followed by facebook visitors. The Bounce Rate of 70% or less means that a decent percent of our visitors dug in for more information on different pages of our site. Takeaway: Our goal was to engage readers and tell our story. So we can see this effort as a success, especially with positive feedback in the comments. We may want to consider providing related content to keep users engaged with a goal of keeping 40% of our visitors reading. 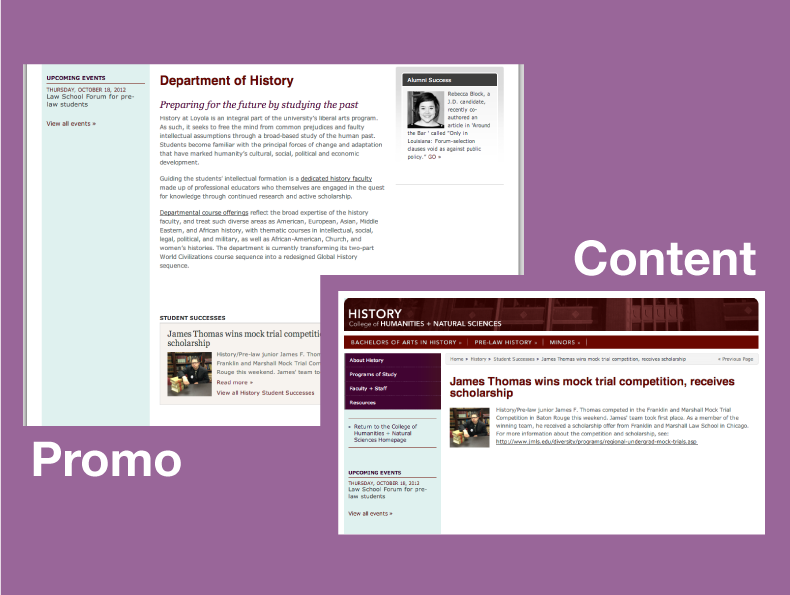 We looked at a recent student success on Loyola’s history website to see what drove traffic to this particular story of James Thomas’ team winning a mock trial in Baton Rouge. Promotion: Promoted via the success feature in our site admin. Analytics: The reason we looked at it in the first place was because it ranked as the 3rd top page on the History site. It was just under the history home and bios sections in popularity. By looking at the analytics we found that the traffic was coming from Facebook. Since we have no knowledge of posting it ourselves, we might assume it was through sharing on personal accounts rather than university pages. Takeaway: Without reporting we won’t know what is popular, and from where our traffic is coming. The site content editor took the first step in making the news available, then someone else took the reigns and promoted it. We should consider doing a better job telling the story of these students in future success posts rather than just a brief blurb. More engaging content will likely result in more sharing and spreading the word. Also, if we did post it on one of our university Facebook pages, then using keyword tagging campaigns would help us better track our own efforts. I’m going to save this topic for it’s own blog post, although we touched on it briefly in the presentation. If you’re eager to hear more about using URL variables in your campaigns, please leave a comment so I can get this information to you quicker. Doing presentations to a group of 25+ is not my greatest strength. Hearing feedback helps improve my performance, but you’ve gotta have thick skin on the criticism. I received a majority of positive feedback in our questionnaire (which Crystal sent to me anonymously), and a few suggestions about things I didn’t cover, or things that may’ve been obvious to more advanced users. So how could I improve for next time? Expectations. Let attendees know before they sign up what level experience we are targeting with the presentation. By targeting the scope of the presentation in our event promotion we’d have a better audience response. People are already taking us up on the offer of basic monthly reports, and some would like more. It’s not too late to provide more feedback or request future blog posts or presentations, so leave feedback in the comments! The most important thing to remember when using PDFs in website content is PDFs are for printing. If content does not need to be printed, you do not want to offer it as a PDF on your website. What are some of the ways you are using PDFs on your website right now? Forms, handbooks, annual reports – these are all excellent uses of PDFs primarily because these are items that someone might need to print, sign, and return to your office or documents that you expect someone to reference frequently in the future so they might want a printed copy. The best way to use PDFs on your website is to talk about the important information on your website, and if you need to offer a way for them to download, offer a link to download the material in a PDF format. A great example of this is in Financial Affairs, where they post policies and procedures for the university. Content on each policy is available on separate web pages, but if a visitor wants to download the entire policy, a link to a PDF is also offered on the page. PDFs alienate website visitors when used to house important information that users want to find through searching the website such as event times, event dates, admission requirements, and policies. One of the major reasons using PDFs for this type of content aggravates visitors is that PDFs are not searchable on the Loyola website. Web Communications has purposefully hidden them from Google’s spiders to protect confidential information in internal documents. Jarring User Experience: PDF lives in its own environment with different commands and menus. Even simple things like printing or saving documents are difficult because standard browser commands don’t work. And once you open the PDF, it’s not easy to navigate back to the website. Orphaned Location: Because the PDF file is not a Web page, it doesn’t show your standard navigation bars. Typically, users can’t even find a simple way to return to your site’s homepage. Crashes and Software Problems: While not as bad as in the past, you’re still more likely to crash users’ browsers or computers if you serve them a PDF file rather than an HTML page. Breaks Flow: You have to wait for the special reader to start before you can see the content. PDF files take longer time to download because they tend to be stuffed with more fluff than plain Web pages. Content Blog: Most PDF files are immense content chunks. They also lack a decent search, aside from the extremely primitive ability to jump to a text string’s next literal match. If the user’s question is answered on page 75, there’s close to zero probability that he or she will locate it. Text Fits The Printed Page, But Not The Computer Screen: PDF layouts are often optimized for a sheet of paper, which rarely matches the size of the user’s browser window. Web Communications has tried to do some of the work for you by providing icons (e.g. PDF, Excel, Word) for links to file attachments in the content management system, Drupal. These icons automatically appear on your page any time you link to a PDF, Excel, or Word document. But in addition to these icons, you always want to indicate to the visitors what they should expect to find when they click on a link. Your intranet is the one place that we tell all campus web editors to post PDFs. This is not a place the average Loyola website users are visiting to browse web pages. Intranets are used as “filing cabinets” at Loyola, cataloguing reports and documentation for accreditation through the Southern Association of Colleges and Schools (SACS). If you’re not sure if a piece of content would be best as a PDF or a web page, err on the side of creating a web page instead of PDF. Caution will help you in the treacherous world of web editing and provide the users of your website a much more accessible experience. Customer service is all about being helpful. To provide the best customer service, you first have to know who your customers are. Your customer may be prospective students, current students, faculty, staff, alumni, parents – or all of the above. What are the words these customers are looking for? Parents might be looking for the word “free” on your website. Students might be looking for the word “fun.” Knowing who your customer is will help you tailor the content to their individual needs. After you know who your customer is, find out the content they want. It might mean that you use an unscientific survey to poll your customers. You may follow-up regular phone conversations with “Did you find everything you needed on the website today? Is there anything we can improve?” The information you gatherwill help you when deciding the words to use on your website and the formatting you use to organize the content. Let’s look at an example. Susie Q. Student is a freshman and straight A student at Loyola. She was the president of the student government association in high school. She commutes locally to attend classes at Loyola. She wants to get involved and make friends. So naturally, she goes to the website to find information about organizations she can join. When she lands on the Student Affairs website, she’s looking for information about student organizations. She sees words like co-curricular programs, residential life, dining, career development, counseling, health, and wellness. But there is nothing on this page that specifically indicates “students” or “organizations.” Susie is new to Loyola and she doesn’t know that co-curricular programs oversees student organizations at Loyola. But the thing is, she shouldn’t have to know that Loyola’s hierarchy to find information on the website. You want to use words that your customers use to describe content on your website so your customers can identify the topics they are seeking. To understand your customer’s needs you have to know what questions are they trying to answer? What are the answers to those questions? What are some of the words your customers use when asking questions? If you know the questions and the answers, why not just turn your entire website into one long Frequently Asked Questions page? A frequently asked questions page is not as helpful as you may think because depending on how many questions you have (say we have 20), you are asking the user to sift through 20 questions to find one particular answer. That requires a lot of time, which our customers don’t have. And any extra time they do have, they are certainly not going to spend it on the Loyola website. So instead, I ask that you consider creating pages based on the topic of information. On that page, you include all of the information the person needs on that topic. What we’ve found through user testing of the Loyola website, most of our students use the search to find information on the Loyola website. Faculty and staff tend to use the A-Z index to find information. Alumni and parents tend to use a mix of the search, the navigation on the website, and the A-Z index based on their skill level with a computer and their experience on Loyola’s website. If someone is searching your website, identifying the topics they are searching for and optimizing the content on your website for those topics is important. One way you can do that is including the terms your customers are searching for in the title of a page and in the content of your page and linking to that content elsewhere on your site. You also want to include these search terms in the names of photos and file attachments posted to the page addressing the relevant topic. When search engines spider through your site to find a relevant match for a search, they will turn up your page as a result. If you want to use an analogy to better understand how your customers relate to your website, your website is a lot like a relationship. It takes time to develop a commitment. When you arrive on the Loyola homepage, there are a myriad of opportunities to explore more information on a variety of topics – everything from event information to academic information to information about how to pay tuition. Every customer is not interested in every topic, so there’s not too much information about any one topic, just a lot of options. But as you dig deeper into the layers of the site, more information on singular topics is served up. 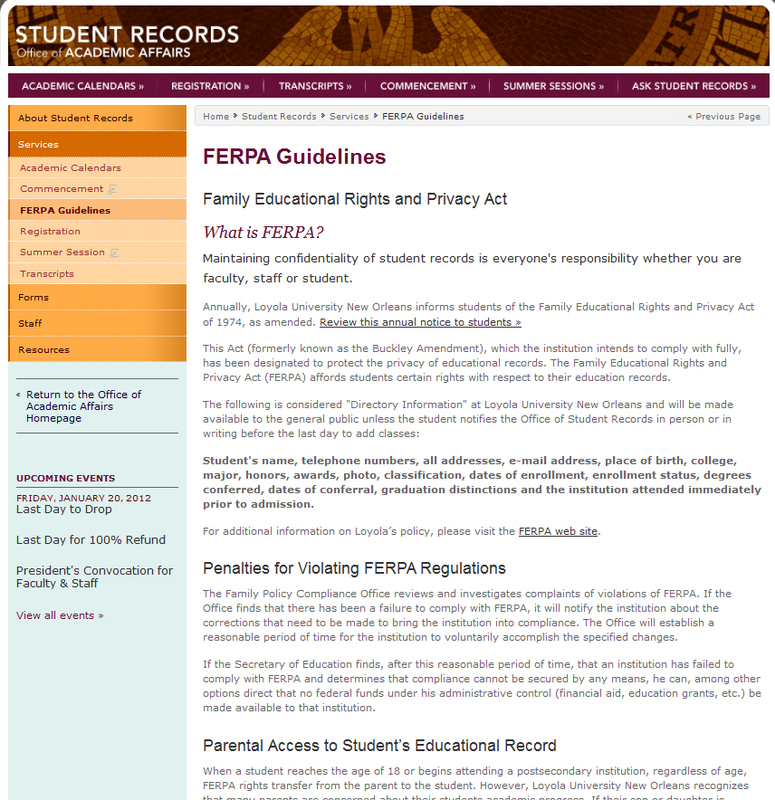 By the time you’ve reached the fourth layer of content on the website (Loyola homepage > Student Records > Services > FERPA Guidelines), a lot of very specific information is presented on the web page because you as a customer are by this time very committed to taking the time to read the details on the page. 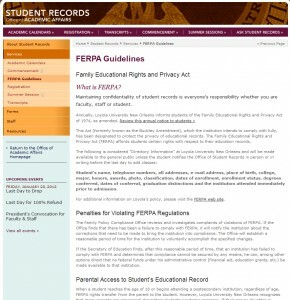 As an example, if you were to take the detailed information on the FERPA guidlines page in Student Records and place it on the Loyola homepage, no one would read it. Even though it’s on the very first page on the Loyola website, it’s too much information that will overwhelm most users, who won’t be committed enough anyway to take time to read all of the information on the page. So the information ends up becoming totally erroneous just by the location of its placement on the website even though it’s on the most prominent page on the website. When you’re considering the new content you’d like to add to your website, be sure to review the content that’s already there first. Take the time to eliminate any out-of-date information and check the links on your pages to make sure the links that were there when you originally posted the page are still active links that are pointing to the information you intended. There’s no faster way to divorce your customer than to offer links to pages that no longer exist. You’re trying to become a trusted source of information for your customer and if you offer broken links, the customer has a reason to question your reliability. Now it’s time to put the content together. You want to organize the information based on the main topics or services your website offers. Use labels for topics that are short and to the point. And use words that your customers are using when asking questions, so they will more easily identify the information when they visit your website. 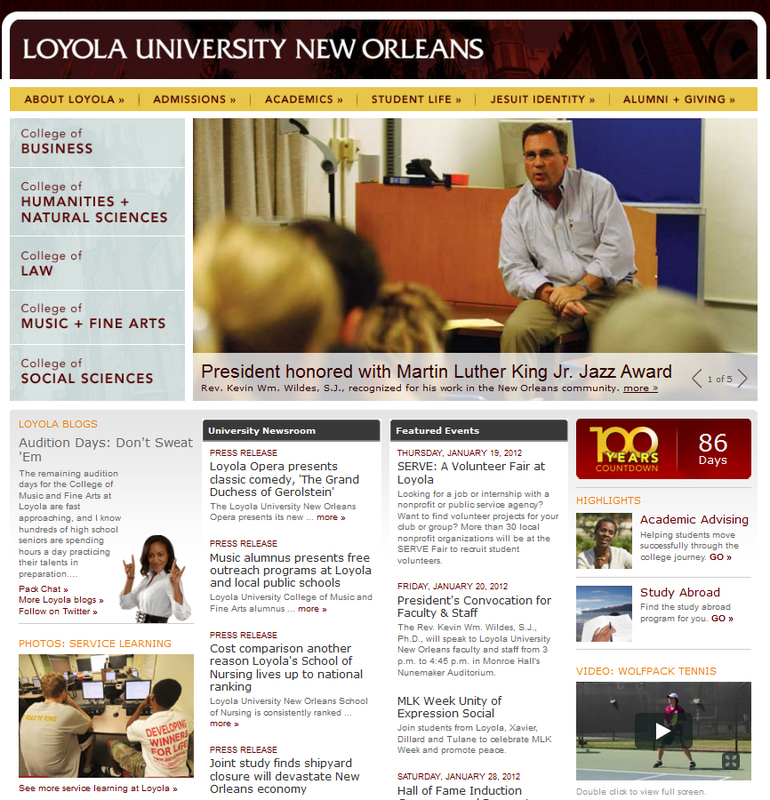 Loyola University New Orleans took all of the above items into consideration when it worked on re-designing the Loyola homepage in summer 2011. The original homepage used navigation with very flowerly language like Discover Loyola, Apply to Loyola, Life at Loyola, Explore Our Jesuit Identity, and Support Loyola. But the problem was, most of our customers didn’t know what those flowerly labels meant. If someone came to the Loyola website looking for information about student organizations, they didn’t expect to find it under Life at Loyola. We also found through user testing that the links in the left menu of the homepage for undergraduate programs, graduate programs, international education, evening programs, centers and institutes, and administration weren’t frequently used. As a result, we re-designed the site to include more straight-forward language: About Loyola, Admissions, Academics, Student Life, Jesuit Identity, Alumni + Giving. We also added larger links to the academic colleges at the university. We tested the changes on a group of users (2 current students, 2 prospective students,2 faculty/staff, and 3 alumni). Each user was given a list of tasks they were trying to complete using the Loyola homepage. Some users had a lot of success and some users were frustrated by the formatting and organization of content offered on the web page they found. In this short video* of our testing, you’ll see a student trying to answer a question about on-campus locations for church services at Loyola. She found the information right away by searching for the term “church services.” In the next task, she was asked to find information about the senior class gift at Loyola. At first, she wants to click on a highlight on the Loyola homepage, but then goes back to the search bar and finds the right result. But when she lands on the page that she was looking for, she is confused by the title of the page and the paragraphs of irrelevant and out of date information offered. The link she was looking for at the very bottom of the page, but she didn’t stay long enough to find it. The page was so unhelpful. She left and never returned. Beware, this could happen to your customers too. *The video is only available to those who attended our training seminar. Use intro text on your pages explaining the main topic of the page. Use contextual links to hyperlink users to related information. Don’t use color in your content when you don’t have a strategy for using it and you don’t implement that strategy consistently. Always keep in mind that the goal in producing and maintaining content on your website is to build trust, educate, and be proactive about the future. If we keep this in mind while being helpful, we’re sure to create happy customers along the way. …And we’re okay with that. Being in web communications, we sometimes have to make decisions for the good of all–decisions that might create ire for some. It’s just part of the job. Loyola has over 80 active sites right now, with thousands of pages behind those sites. We constantly (and by constant I mean on a daily basis) try to improve both the content on those pages and the methods of creating and delivering that content. Over the years we’ve had numerous training seminars conducted, processes developed, and procedures manuals created to support that effort. As a whole, I think the university has been largely successful with delivering a web presence that’s cohesive, progressive, and easy to navigate. We’ve seen evidence of this through our analytics, the usability study we conducted in the spring of 2011, and anecdotally through being consulted by other universities (hoping to set up shops like ours) and interviewed by the likes of University Business (articles here and here). Some of the issues the author, Michael Fienen, raises are things that we’ve already tackled (like coming up with and finessing strategies to keep key pieces of content updated), or are actively trying to solve (like dealing with turnover and educating our stakeholders on website evolution vs. website completion). Another huge part of our jobs here in web communications is listening and questioning our current methods and practices. What frustrates you? What can we do better? Some of our best solutions have come from the ongoing dialogue we have with the campus community. If you’ve got something to share, we’d love to hear it! 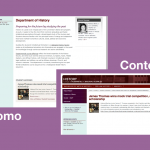 We’ve developed a seminar series for web editors to discuss best practices. We hope you will join us for the first in this series. Once upon a time, your e-mails meant something to someone. Now, they’re getting sifted away to the spam box. Help re-invigorate your e-mails and e-newsletters with tips and examples on writing subject lines, choosing stories, improving your process for compiling content, and analyzing your success. RSVP to cfbolner@loyno.edu if you plan to attend. You have less than 30 seconds to engage a visitor to your website before you lose them forever. Learn about empathizing with your user and engaging your website’s audience through the labels and content you post on your site. Find out about organizing and using formatting effectively, adding contextual links, photography and more to provide your audiences the information they seek. April 26, 2012 Social Media – The dos, the don’ts, and the did you reallys? Your boss is always talking about your department’s need for a Facebook or Twitter account to market your department and its achievements. But did you know that Loyola has more than 5,000 fans on the university’s official Facebook page? Did you know that you can tap into that audience too? Find out how, and get tips from the experts if you end up deciding you want to start your own “official” Loyola social media account. You received a PDF or Word document in an e-mail and were asked by your manager to post it to your website. Find out more about giving that content a proper home on your website and broadening its visibility and usefulness. There may be a right time to use a PDF or Word document on your website, but how do you know when it crosses the line into website taboo? Web analytics can offer insights into the planning process for content, including informing and affirming assumptions about your website, evaluating the impact of problems with your content, and helping you set priorities for maintenance of the information you provide. Learn more about what the numbers mean and find opportunities to set up objectives in your analytics to help you reach your website’s content goals. It’s got color. It’s got curve. 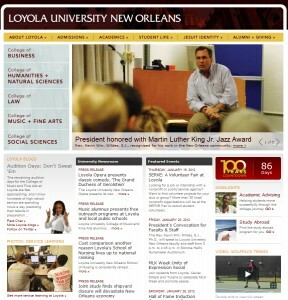 It’s everything you dreamed about and more – it’s the Loyola website. 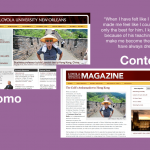 Learn more about how Loyola got its look and what web communications does to maintain consistency and near perfection through its typefaces, visual cues, and photography. Hosting an event is hard enough. 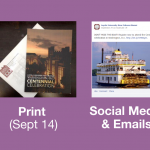 Make publicizing the event easy by taking advantage of all the tools offered in our new and improved university calendar system. As the web team rolls out the new calendar system, there are two event listing items that I want to discuss. Event type and description aren’t new in terms of the type information we are asking you to provide, but since we now have robust calendar search options, it is important for you to know how to take advantage of them for the benefit of your readers and your department. By tagging event types and providing complete event descriptions, you can help website visitors find the events they are looking for and have all the info they need to know about attending events. Reading an article on the innovative spirit of Walt Disney, and his uncanny ability to blend those innovations with ethics and business, I’m reminded of how much curiosity plays into our daily life here in web communications. And curiosity is not just a Disney thing, it’s definitely a Jesuit thing too–looking for God in all things, commitment to excellence, critical thinking, and a constant desire to better yourself and the world around you are all precursors for, or results of, being curious and open. Looking past the status quo–being curious and seeking out new solutions to problems that may or may not yet exist–is at the heart of what it means to work at Loyola, and (pardon my high-mindedness) certainly the core of our work here on Loyola’s website. Keywords are specific words or phrases that relate to your website’s subject matter. In essence, they describe what your website is about. Search engines like Google will index your website and come up with their own set of keywords to describe each page. It’s up to you to ensure that the words and phrases that best describe each page are used numerous times and placed prominently.